Plucking of mangos, the highest juicy and delicious fruit of the summer season, has begun at different orchards in the district. 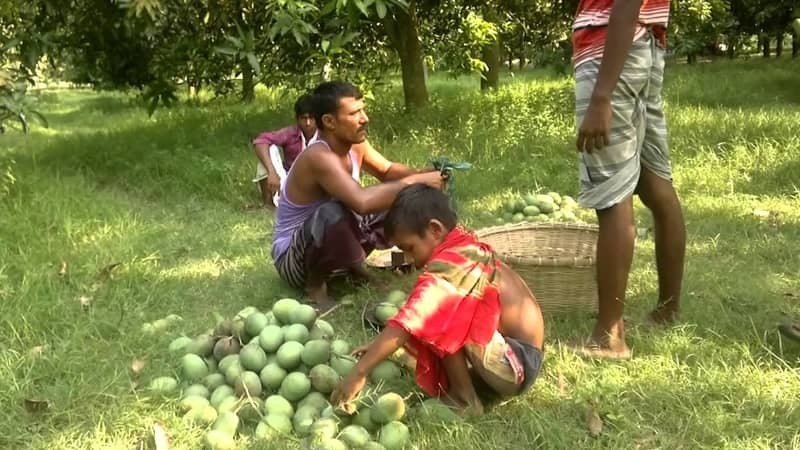 Mango growers in different upazilas of the district have started to pluck ‘Gopalbhog’ and ‘Guti’ mangoes in the first phase. After collecting ‘Gopalbhog’, they will pluck ‘Khirsapat’. The concerned authorities of the district administration have given specific directions to the growers about collecting mangos. If the weather remains favourable, the possible yield in the region for the current season will cross six lakh metric tons, according to sources at Department of Agriculture Extension (DAE). Earlier on May 9, the district administration held a meeting, presided over by Deputy Commissioner S M Abdul Kader, with the DAE officials, mango growers and traders. It was decided in the meeting that plucking of mangoes to begin from May 20. The concerned officials also fixed June 1 to start plucking ‘Khirsapat’ while ‘Laxmanbhog’, ‘Amrupali’ and ‘Fazli’ will be plucked from June 16 and ‘Ashwina’ from July 1. Besides, monitoring committees in coordination with upazila nirbahi officer, upazila chairman and agriculture officer have been formed for each upazila. The committee will work to ensure security and provide all the necessary support and facilities to mango growers, traders and buyers. A temporary office has been setup at Baneshwar Bazar in Puthia upazila and decision was taken to keep the branches of different banks in Baneshwar Bazar open even in Saturday. Three executive magistrates will perform 24-hour duty as well as police will work round the clock to ensure security for safe transport of mangoes. SM Abdul Kader, deputy commissioner of the district, said the time frame has been fixed so that consumers can buy mangoes without fear of chemical mixing. “The decision will protect interests of everyone including mango growers, traders and buyers,” he said. The DAE office sources said mangoes have been orchard in a total of 17,463 hectare of land this year which was 16,961 hectare in the previous year.